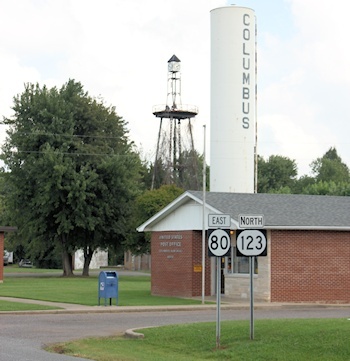 At ColumbusKy.com, we highlight the unique history of Columbus, Kentucky. Western Kentucky's oldest town, this small hamlet has seen its rise and fall throughout history. One could compare the volatility of the town's past with the wildly unpredictable Mississippi River, which plays a major role in the town's history. We hope you enjoy our articles regarding the Battle of Belmont, which took place across the river from Columbus. Also you can take a look a the Old Columbus community and how the mighty Mississippi River forced the relocation of the town. We also highlight the importance of the river and the Mobile & Ohio Railroad that create Columbus a major regional transportation hub in the 1870s. Finally, discover Columbus today and the nearby Columbus-Belmont State Park. Columbus, Kentucky: The U.S. Capital? Local legend states that Columbus, Kentucky was once (or twice, depending on what you read out there) considered to be the location of the United States capital. This is not true. When Washington, D.C. was burned in 1812 by the British, discussions were had about relocating the U.S. capital to another site, preferably in the middle of the country. Columbus was reportedly suggested, but the town didn't exist in 1812. Perhaps the area around Columbus was pitched, but there are no official congressional records to suggest this town could have been our U.S. Capital. © 2013-2019 Explorations Media Group, LLC. All Rights Reserved.